Comparing the size of his pool to Kanye West’s, Drake caused a stir by rapping, “Ye’s pool is nice, mine’s just big is what I’m saying” on Summer Sixteen. West responded to Drake by reportedly building a lake-sized pool in his backyard. Yet despite the pool-based sparring of Drake and West, the two rappers’ pools pale in comparison to the ones found in places like Sharm el Sheik, Egypt and San Alfonso del Mar, Chile, where two of the ten largest swimming pools in the world are located. How large are these swimming pools? Well, scroll through to find out, and perhaps while you’re at it, start planning your next vacation to visit one of these gigantic pools. 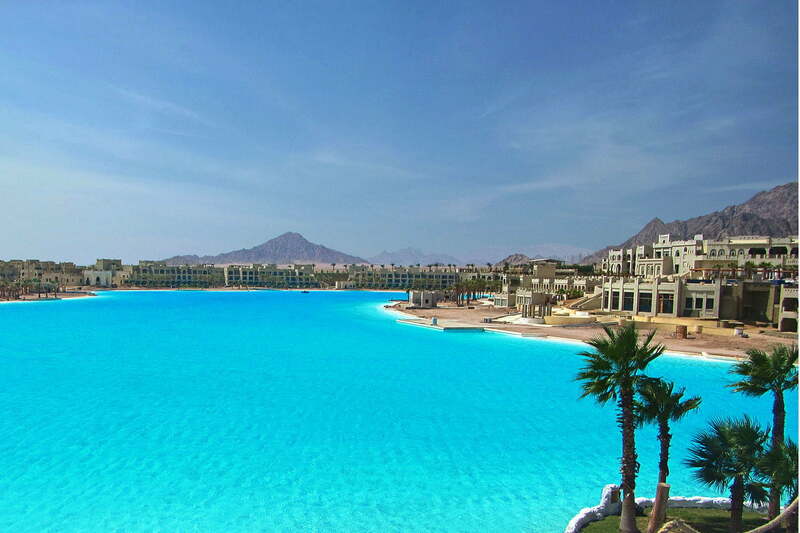 Located in an Egyptian resort town, the crystalline lagoon at Citystars Sharm el Sheik currently holds the Guinness World Record for the largest man-made body of water with an official measurement of 23.9 acres. 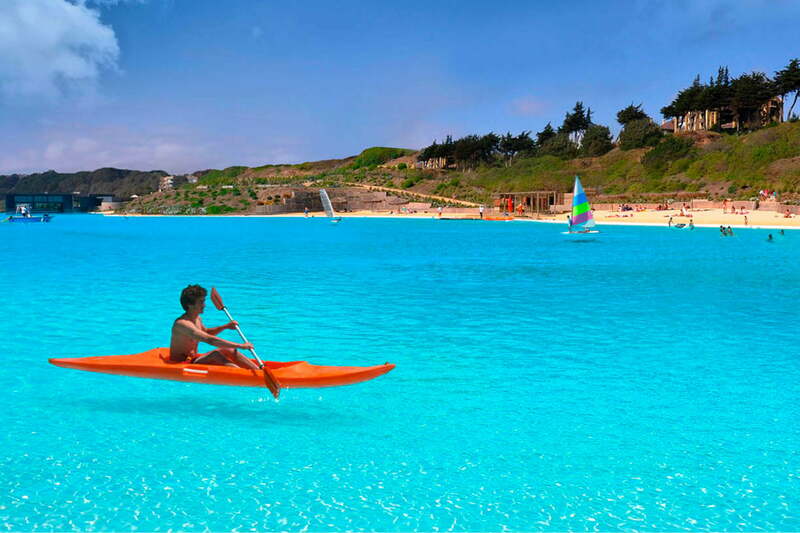 Technically, it’s the “largest crystalline lagoon,” since it mimics a natural body of water, but maybe that’s even more impressive. 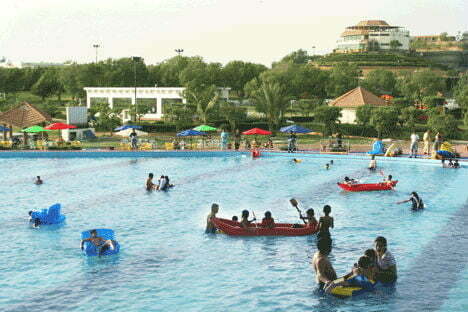 Amazingly, the pool was constructed in the middle of the Sinai desert and is just three miles from the Egyptian coast. If building a massive pool so close to the actual sea seems excessive, that may be the least extravagant aspect of the Citystars’ lagoon as it also cost $5.5 million to be built and takes several weeks to be filled with salt water. 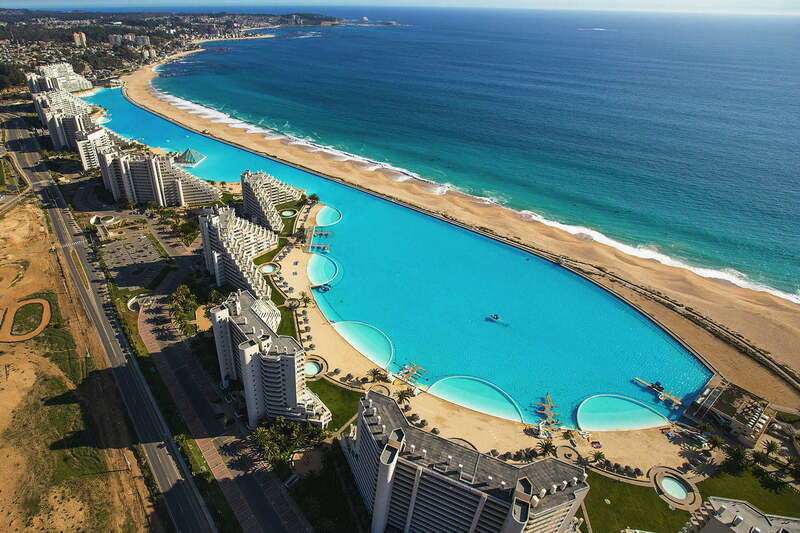 Roughly the size of 6,000 backyard pools and officially measured at nearly 20 acres and 66 million gallons of water, the San Alfonso del Mar was built by the same company as the Citystars lagoon, which is why they share similarities (although this pool has a more traditional construction). Similar to the Citystars lagoon, the San Alfonso del Mar is filled with salt water and was built in close proximity to an actual beach. 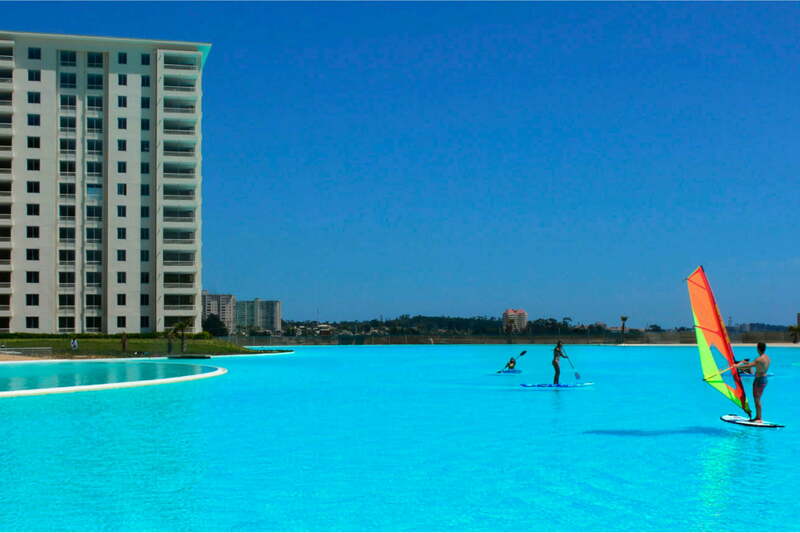 The salt water in the San Alfonso del Mar is constantly regulated, so it’s always warmer than the nearby sea. Centrally located in an exclusive and luxurious country club, the 17-acre pool at MahaSamutr (translated as “the ocean”) is unique not just because of its size. MahamSamutr acts like a personal mini-sea for members of the country club as it can be used like a traditional beach, but also for water sports like kayaking, paddleboarding and even sailing. It also has large villa-filled island in the middle, connect to the “mainland” by a road. Part of the Las Brisas luxury condominium complex, the five-acre saltwater pool may seem diminutive compared to the other ones already listed, but it’s roughly the same size as 16 Olympic-sized swimming pools. Like the other much larger pools, the Las Brisas pool overlooks the Pacific Ocean and its sparkling blueness often is a more brilliant hue of blue compared to the real thing, which is located just a stone’s throw away. This is a weird story, but well worth the inclusion: For many years the Orthlieb Pool of Casablanca, Morocco was thought to be the biggest pool in the world. According to the reports, it measures 1,574 feet long and 246 feet wide, with an amazing area coverage of 8.9 acres. Sounds pretty impressive, right? There’s only one problem – there’s little sign that the Orthlieb ever existed, and less sign that it’s still there today. The only reports of the Orthlieb are decades old, and there are no photos to be found online (don’t be fooled, some people try to label pics of the San Alfonso Del Mar or other pools as the Orthlieb). The only thing we have are some dubious and ancient postcards claiming to feature the pool. So what happened to this mythical giant pool? Was it planned for construction but never built? Did it get filled in for other building needs long ago? Or does it still exist somewhere out there, hidden inside Casablanca? We may never know the full story. 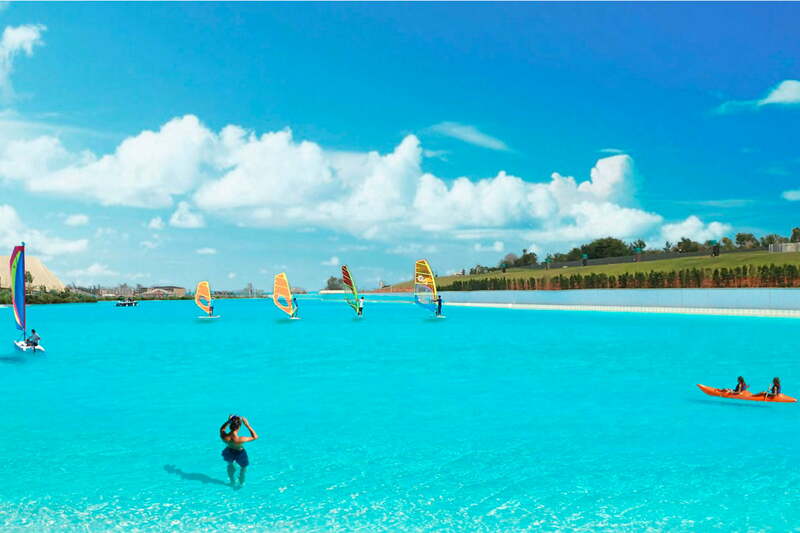 Spanning over 150,000 square feet and measuring close to 3.5 acres, the pool at the luxurious Laguna Bahia is big enough for a variety of water sports like kayaking and even windsurfing. The pool has a dedicated shallow area for children and a lengthy beach that offers ample room for lounging. With a name like Dreamworld, it shouldn’t be surprising to learn that the world’s largest freshwater swimming pool is located at the aptly named resort and theme park. At about two acres, the Fun Lagoon contains approximately two million gallons of local well water and offers water-themed activities like rowing boats, swings and inflatable slides. Thanks to a massive renovation, the Hayman Island Resort pool, just off the Great Barrier Reef, is the size of seven Olympic swimming pools put together, and is actually a giant saltwater pool surrounding a freshwater pool (with a bar area, of course). The resort says that it’s the largest pool in the southern hemisphere: We’re not totally convinced that’s true, but it certainly is impressive either way. Featuring Art Deco architecture, the Piscine Alfred Nakache was built in the 1950s, which makes it one of the oldest pool complexes still in use in the world. Despite its age, the pool complex offers visitors about 1.8 acres of water to swim in as there are both outdoor and indoor pools. 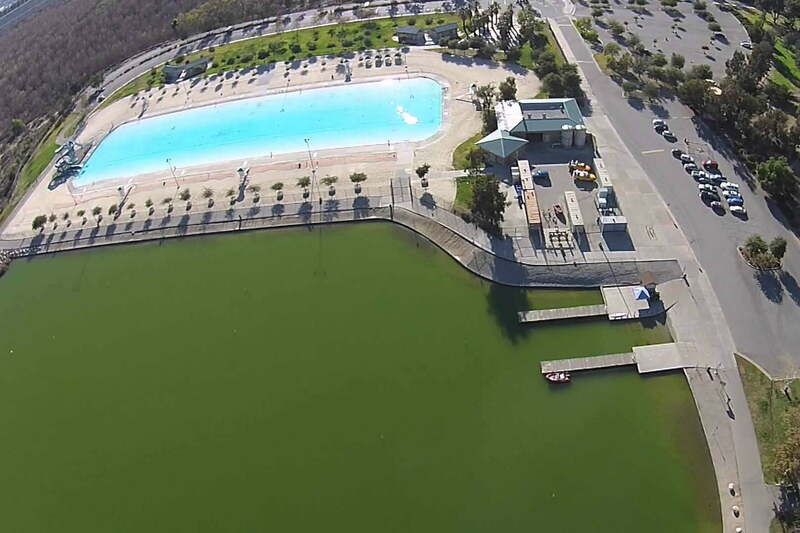 Located in Los Angeles, the 1.5 acre swimming lake at the Hansen Dam Recreation Center has two waterslides and is just five feet deep across its entirety. 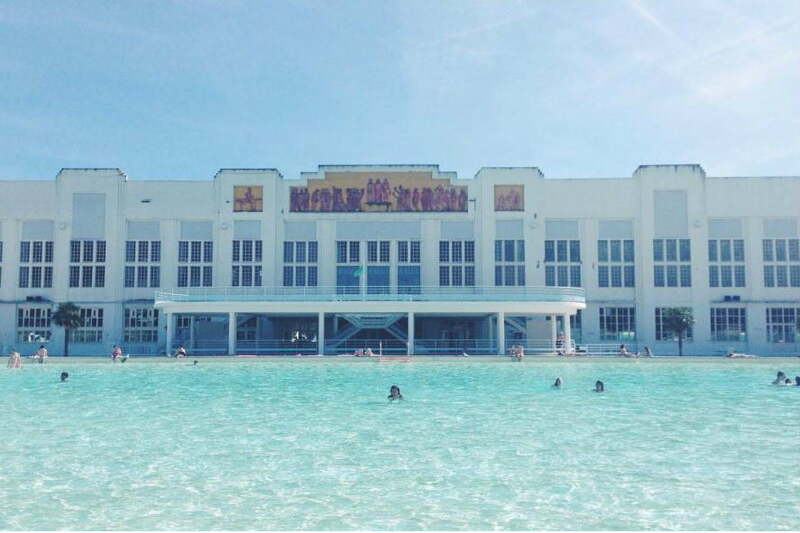 The pool is located right next to an actual lake that is no longer suitable for swimming, so its referred to as a “swim lake” since it simulates the lake with sandy areas and is large enough to hold 3,000 swimmers at once. Spanning the length of three Olympic swimming pools, the pool at Markina Sands Skypark is located 57 stories above ground, which means it offers impressive city views of Singapore. 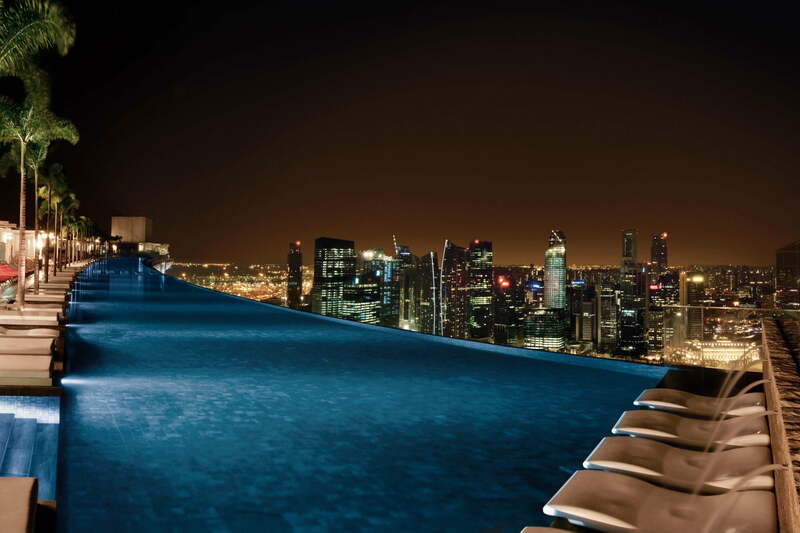 Since it’s located so high up, it’s the world’s largest rooftop infinity pool in the world.